This elastic has an improved quality over other brands that can be visually seen and experienced NonRoll resists rolling twisting. Choose ribbed for heavier fabrics. 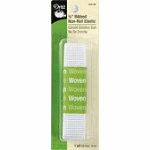 Insert into casings or stitch directly to fabric for waistbands on skirts, pants and shorts. Size: 34" 19mm. 1 yard package. 4 packages per box. Purchase by the box. First Available June 2010.